Make the crust dough: Pulse flour and salt together to combine. Add scoops of lard and pulse into the mixture has the texture of coarse sand, about 10 seconds. Add in chunks of butter and pulse until butter pieces are no larger than small peas, about 10 pulses. Add minimum amount of water and pulse on low. If dough remains crumbly and doesn’t come together, add another 2 tablespoons of water. Add as little as is required to enable the dough to be rolled into a ball. Form the dough into a disk, wrap in plastic, and refrigerate for 20-30 minutes. Toast your almonds: While the crust dough is chilling, preheat your oven to 350 degrees F and spread your sliced almonds out on a baking sheet. Toast for about 4-6 minutes, using a spatula to gently flip and stir the almonds ever 2 minutes. They burn quickly, so keep a close watch on the nuts and remove them when they just start to get some color and are fragrant. Mine took about 5 minutes. Finish making your crust: Preheat oven to 450 degrees F. Roll disk of dough out to around 2 inches larger than your (9-inch) pie plate and transfer it, situating it in the plate. Fold the excess dough around the edges and crimp, trimming where necessary. Cover the dough with parchment paper and fill with pie weights or dried beans, pressing to the edges. Bake for around 20 minutes. Remove weights and paper, egg wash crust, and bake 5-10 minutes more, until golden brown (you won’t be baking it again, so make sure it has good color — shielding edges with foil if they begin getting too dark). Let crust cool completely. Make cream filling: While the crust bakes, prepare your cream filling. Prepare an ice water bath in a bowl big enough to accommodate your saucepan. Mix sugar, cornstarch, flour, and salt in a saucepan over medium-high heat. Stir in the milk and bring to a boil, stirring constantly. Reduce heat and cook until thickened, still stirring constantly. Spoon out about 1/4 cup of your hot mixture and gradually drizzle it into your beaten egg, whisking constantly. This will temper the egg so that when you add it back into the hot mixture, it won’t cook. Add the egg into the hot mixture, continuing to stir constantly. Bring this just to boiling. Assemble the pie: Cover bottom of crust with toasted almonds, and then dollop in chilled cream mixture, spreading it smooth with an offset spatula or the back of a spoon. 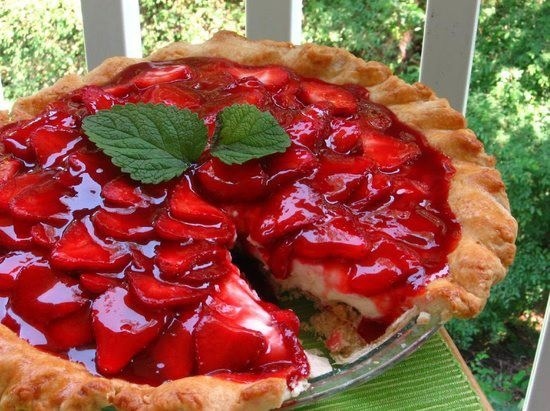 Slice about a cup of fresh strawberries and layer them in overlapping concentric circles on the top of your pie. Chill this while you make your glaze. Make the glaze: Crush remaining 1/2 cup of strawberries and cook with water in a saucepan over medium-high heat for two minutes. Strain through a fine mesh sieve and discard the pulp. Add the juice back to the saucepan over medium-high heat and gradually stir in sugar and cornstarch. Cook until thickened. If you want, you can tint this glaze with food coloring to desired hue, but mine was plenty bright enough! Cool the glaze slightly (I transferred mine to a heat-proof measuring cup with a pour spout to cool for a bit) and then pour over top of strawberry slices on your pie. Garnish with big mint leaves, if you’d like, or whole strawberries. Chill entire pie for at least a few hours for best results; cut with a knife held under hot water and then dried. Note on timing: There are several components of this pie, but their preparation fits together nicely. You can make the crust dough and while it’s chilling, toast your almonds and set them out to cool. While the crust is baking and cooling, make and refrigerate the cream and slice your strawberries. Assemble these things once the crust is cool, and chill your almost-completed pie while you whip up the glaze. Chill the whole concoction for a few hours before slicing for best results.